Moonflowers and Morning Glories are vines which have been favorites in Texas gardens for many years. Although they are closely related, moonflowers (Ipomoea alba) come only in white, bloom at night, and are scented to draw night-flying moths for pollination purposes. They are easily grown from large seeds, which appeal to children. Heart-shaped dark green leaves contrast with the six-inch waxy white blooms which are produced through the summer. The vines are usually 6-foot mannerly climbers, but can reach to 30 feet in areas with a long growing season. They are especially nice for evening gardens, scented, or white garden plantings. Children also enjoy watching for moonflowers to burst open in the evening, usually all at the same time, with a small audible pop. They will succeed in ordinary soil and full sun. Protect them from strong breezes which might cause tattered leaves. Morning glories are day bloomers without a noticeable scent, and can be found in many colors ranging from white to red, blue shades or streaked color patterns. Several varieties are so dark as to appear almost black. The standard old-fashioned favorites, a mix of several species of Ipomoea such as purpurea, tricolor and Nil, include �Pearly Gates�, white with blue shades, �Crimson Rambler�, a deep bright pink, �Scarlet O�Hara�, a cherry red, �Grandpa Ott�, which has very dark, smaller blooms on a less rampant vine suitable for porch posts, �Blue Star� and �Flying Saucers�, with streaked shades of blue. These varieties are vigorous and easily grown. They also will thrive in ordinary garden soil with full sun. 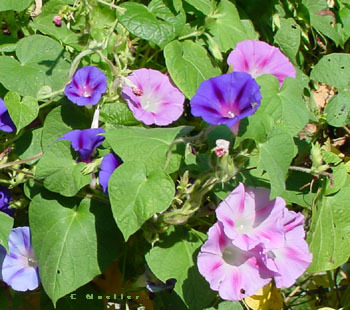 Do not over-fertilize morning glories or there will be too much foliage and too few blooms. Some morning glories take a little more care to get going, including �Mount Fuji�, with variegated splashes of cream on green, heart shaped leaves and blooms of streaked and mottled colors on white or other backgrounds. Another Japanese strain of great color appeal is the Silk Series, which has flowers up to six inches in diameter in soft pastels with white throats and picotee edging.